PERFECT FOR CREATING A DESIRED AMBIANCE WHILE RELAXING AT HOME, WORKING IN THE OFFICE, OR ENTERTAINING. JARO Art is a compelling, visual art online service that can beautifully transform and inspire any environment. JARO Art features a diverse mix of art by up-and-coming, emerging, and established visual artists and photographers. Browse and explore a growing, diverse, and dynamic catalog of artistic images to select from. Display galleries on any Internet connected device. Large flat screen TVs yield an affordable luxury experience at home, work, or play! Curate personalized galleries based on individual preferences such as subject, style, color, medium, and artists. READY TO LEARN MORE ABOUT JARO ART ? SIGN UP FOR OUR JARO NEWSLETTER! Personalized curated gallery of visual art content. Modify and change your art and photography selections at any time. Upload and display approved personal images into your personal JARO Art Gallery. JARO Art works on any device (Android, IOS, Smart TVs, Computers, and Roku). 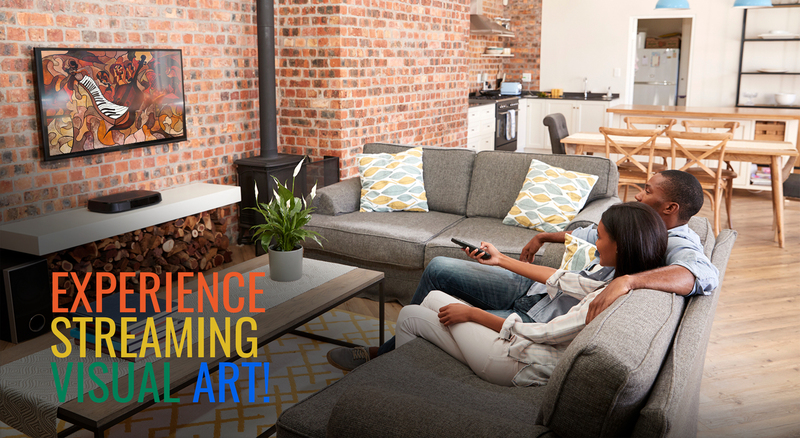 View JARO Art on multiple TVs in your home. Month-to-month subscription on Roku includes JARO Art Lite service, our monthly newsletter, social media forum, artists showcase, and industry specific “edutainment” and tips. The ROKU Logo is a trademark and/or registered trademarks of Roku, Inc. in the United States and other countries. Our JARO Art content library is organized by title, artist name, subject, and descriptive tags so you can easily discover the works or artists that you love. Browse, select, and display your JARO Art Gallery on-demand from our library or just watch JARO curated Viewlists. View your JARO Art anywhere anytime. Your JARO Art travels with you wherever you have broadband access – your home, office, or while traveling for work or pleasure. 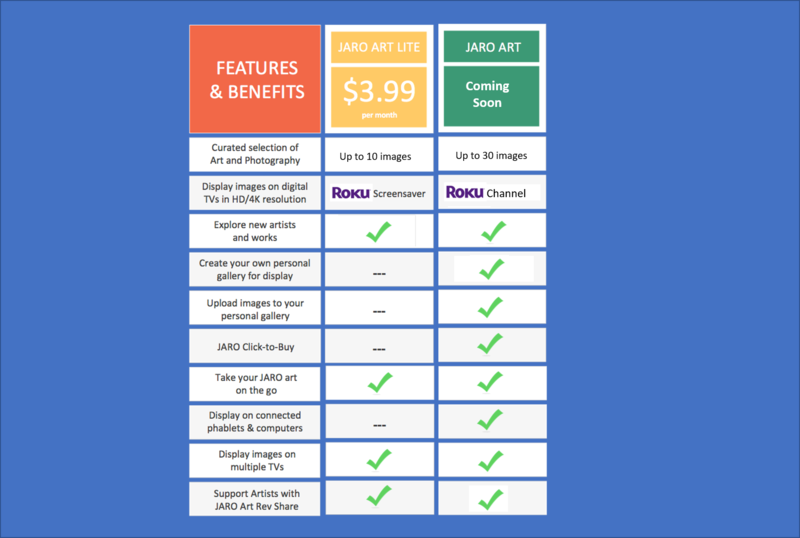 Our introductory JARO Art Lite subscription rates on Roku are discounted and include access to Basic and Premium content. During our six-month introductory period, all Artists Membership Fees are waived. ARE YOU A VISUAL ARTIST OR CREATIVE PHOTOGRAPHER? Share your work with our growing global audience and community of select creators. We’re building a dynamic collection of visual art and photography for display on TVs and Internet-connected devices via a unique subscription service and distribution model. All artists have the opportunity to sell their original works and or prints with 0% commissions.